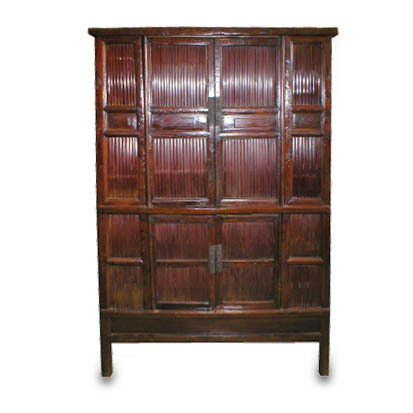 A rarer Su-Zhou style wider bamboo kitchen cabinet made of rare Bai wood and bamboo slats. It has nice smooth darker finish with beautiful bamboo patina. 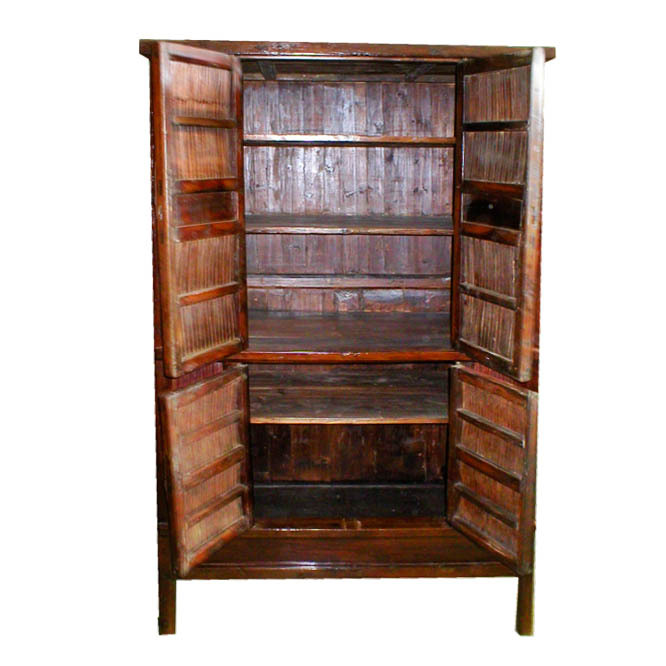 Although there are other similar types of bamboo kitchen cabinets with bamboo slats from the early 20th century from nearby Ningbo and Shanghai area, Few can be found from the Su-Zhou area that are made of Bai wood and are older and wider in width. Furniture pieces made of Southern Bai wood, Southern Chinese cypress, can be dated to the 17th century and are very rare. Age: 120-150 years old. Finish: French Polish over the original wood and bamboo patina. Suzhou is now considered the source of Ming furniture. This is because Suzhou was often chosen by the dynasty emperors to build summer palace for its natural beauty. It also became a gathering place for the literary and social elites. Hence, giving its cultural element as well as the availability of the variety of exotic wood, it had for centuries attracted the best craftsmen and wood workers who flopped to the area to showcase their skills in building the best woodwork. Hence, Suzhou earned a reputation for the elegance and the craftsmanship for the woodwork produced in the area. Dimensions: 43.75" x 22.25" x 73.125"